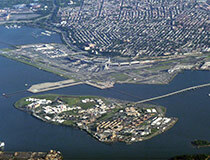 LaGuardia Airport and Rikers Island. I bring up Rikers and LaGuardia because they are within 200 feet of each other, but otherwise a world apart. The abuses at Rikers show New York at its worst, but an expanded LaGuardia could be the world’s leading airport. LaGuardia is the smallest of the tri-state area’s three airports and very difficult to get to via mass transit. Its short runways cause safety problems and frequent delays and limit its destinations, and it is in a flood zone. 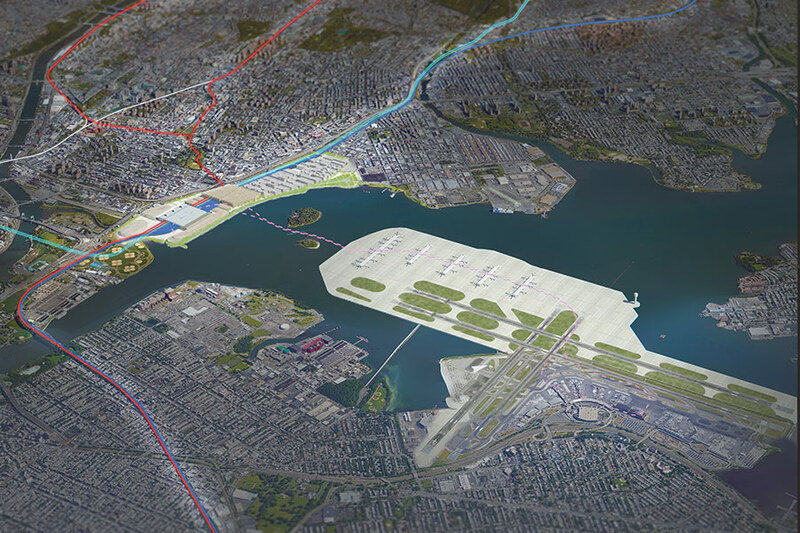 These problems can be solved by expanding the airport onto Rikers Island and adding a new terminal across the East River in Port Morris, the Bronx. By adding this infrastructure and increasing airport capacity, we would gain a significant opportunity to expand New York City’s economy beyond Manhattan. Jim Venturi’s ReThinkNYC plan calls for the closure of Rikers Island and the expansion of LaGuardia Airport, as well as the unification of the regional transit systems. The Rikers Island Jail complex is the world’s largest penal colony, housing between 12,000 to 15,000 prisoners. While other cities closed their jail-islands decades ago, New York has doubled down. Ten of the city’s 15 jails are now on Rikers. Eighty-five-to-92 percent of the inmates are awaiting trial, but cannot afford bail. Mayor Bill de Blasio is trying to reduce the Rikers population and has described the culture there as part of the problem. However, any jail on an island will be toxic. The best way to fix it is to close it. A Swedish architect asked, “If the guards could go out to lunch, how would that change the culture?” If the new facilities were smaller, decentralized, and easily accessible by subway, more could be done to engage the families and the community. And by doing so, recidivism would be reduced. The closing of Rikers would allow LaGuardia to expand its flight capacity and add long haul flights to global destinations to meet a growing regional demand. In 2011, the Regional Plan Association estimated that in order to keep pace with future growth projections, New York City needs 78 more flights per hour during peak times. This plan creates the additional capacity. But for LaGuardia to be a modern airport, it must also have strong subway and regional rail connectivity. All over the world, short haul air traffic is being redirected to high-speed rail. For example, France’s TGV has decimated the domestic air market. China and Japan are even more ambitious. Many passengers already choose Amtrak’s Boston and Washington service over air travel. But much more can be done. The Northeast Corridor runs through Port Morris, the Bronx. This neighborhood is across the East River from Rikers Island and the airport. LaGuardia’s proximity to this rail line makes it the most attractive of the three airports for expansion. By creating a terminal at Port Morris, we’re able to connect every New Jersey Transit, Metro-North, and Amtrak line in the region. A Second Avenue Subway extension and a new branch of the A train would provide additional connectivity. Passengers arriving at this station would check in, drop off their bags, travel by AirTrain under the East River to concourses on Rikers. This would mean a single-seat ride to LaGuardia for millions and provide the foundation for moving many more short haul flights to the rails. This can be done cost-effectively by bringing Penn Station’s problems into the equation. Penn Station is overcrowded and has no capacity for much needed additional trains. This is in part due to the inefficient manner in which the station is used. For example, even at rush hour, New Jersey Transit and Amtrak trains often sit on platforms for 20 minutes before continuing to Sunnyside Yard. This is necessary because the station is being used as a terminal. Conductors must check to make sure everyone is off the train and Amtrak trains must be cleaned and have their cafe cars restocked. We solve this problem by making the last stop on these trains the new Bronx-LaGuardia rail station. This would greatly improve the efficiency of Penn Station and save money by removing the need for the proposed Penn Station South. PROPOSED PORT MORRIS, BRONX STATION/AIRPORT TERMINAL/CONVENTION CENTER & HOTEL COMPLEX. This increased capacity at Penn Station makes it possible to host Metro-North’s Harlem, Hudson, and New Haven trains. 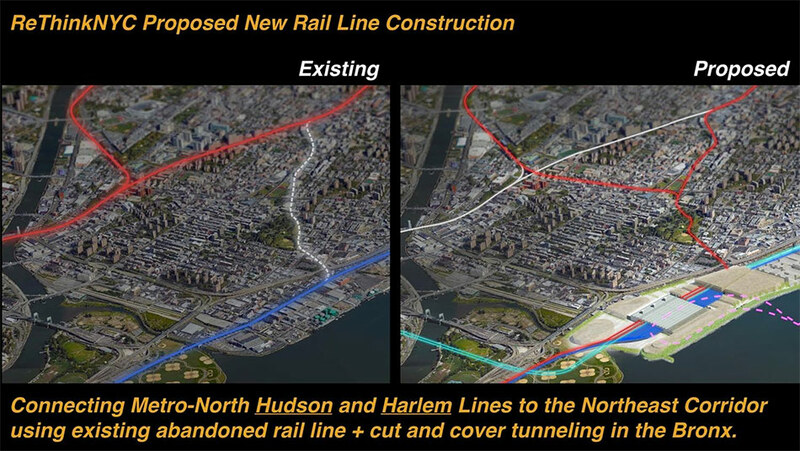 To do this, we re-use an abandoned rail line and build a short tunnel to connect the Harlem and Hudson lines to the Northeast Corridor. This would give millions of Metro-North customers a single-seat-ride to LaGuardia and Penn Station. This new Metro-North connection would bring every rail line in the region through Sunnyside, Queens, making it an ideal place for a station. At Sunnyside Yard, we are proposing a new major transportation center that would include a 20-track rail station, a light rail and bus station, and connections to seven existing subway lines (E/M/R/7/N/Q/G). 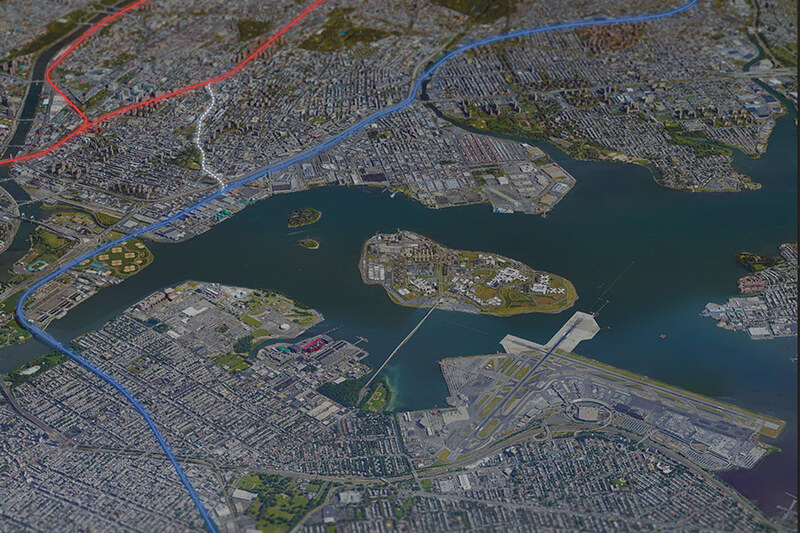 Rail unification involves building Port Morris and the Bronx Station (center), EXTENDING NJT/AMTRAK TRAINS TO THE BRONX; CONNECTing METRO-NORTH HARLEM AND HUDSON LINES TO NORTHEAST CORRIDOR AND SECAUCUS LOOP PROJECT, and building SUNNYSIDE STATION SERVING ALL COMMUTER LINES IN THE REGION (right). To accommodate growth, we propose rezoning much of the area around the station to accommodate greater density, which would provide millions of square feet of rail-connected office space and plenty of housing. We would convert the rest of the Sunnyside Yard site to a 300-acre park, which would include restaurants, green space, and cultural facilities. The combination of this new transportation complex, which would be a single-seat-ride away from every commuter station in the region, and the park, would provide a foundation for tremendous growth in Queens. In the Bronx, adjoining the LaGuardia Airport Rail Station, we propose a 3.8 million-square-foot convention center (replacing Javits), hotel, restaurant, and shopping mall complex. This new infrastructure would offer pedestrian connections to the adjacent neighborhoods. New York City was unified in 1898, but more than a century later many still think of New York as Manhattan. We can no longer afford this mindset. If we are to compete with other global cities, such as London or Shanghai, we cannot do it with one hand tied behind our back. In order to meet this challenge, we need to be unified as a city and a region—socially, infrastructurally, and economically. We are calling our plan ReThinkNYC—keep up to date with the plan on our website.